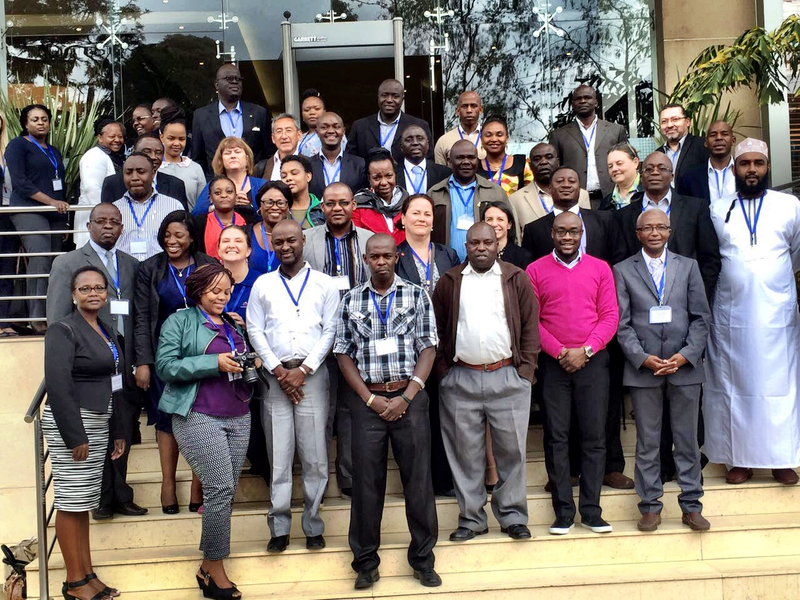 Civil society principal recipients (PRs) from across Africa recently gathered in Nairobi, Kenya to consolidate their collective knowledge and experiences and establish a formal community of practice. From 29-31August, 65 participants from 20 African countries demonstrated their commitment to strengthening the implementation of Global Fund grants through increased collaboration and peer learning. This is the first time such a diverse group of civil society PRs – from Liberia to Somalia to Comoros – were together in the same space, brought together by a common goal. The meeting was jointly hosted by the Technical Support Facility for East and Southern Africa (TSF ESA); the Regional Platform for Communication and Coordination for Anglophone Africa (hosted by EANNASO); and the UNAIDS Regional Support Team for East and Southern Africa. The Global Fund’s 2012 results report (the last time the Fund published composite grant performance results by PR type), shows that civil society PRs often outperform both government and UNDP as implementers. 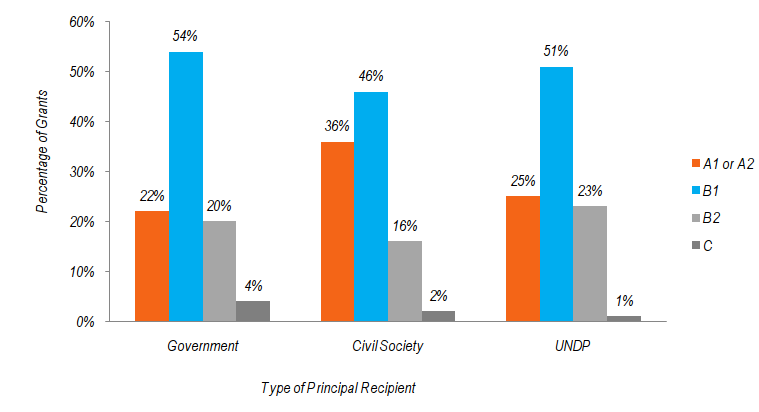 In 2011, 36% of civil society PRs had either an A1 or A2 rating, compared to 25% for UNDP PRs and 22% for government PRs (see figure). A wave of new civil society PRs were ushered in along with the new funding model (NFM) in 2014, partly due to the NFM’s renewed emphasis on civil society engagement. For instance, Botswana and Swaziland both added first-time civil society PRs in 2014 (the African Comprehensive HIV/AIDS Partnerships and the Co-ordinating Assembly of Non-Governmental Organisations, respectively.) Grants in those countries had been previously implemented by a single government PR. South Africa added two new civil society PRs in 2015, Kheth’Impilo and the AIDS Foundation of South Africa. With many new civil society PRs, there is a need to prioritize training and learning spaces for these new implementers. In 2015, the TSF ESA conducted a survey among civil society PRs to determine their capacity building priorities. The following year, the results from a needs assessment survey conducted by EANNASO revealed that 33% of respondents reported that civil society organizations do not always have the capacity to implement large grants, and 23% indicated that too much time is spent on complicated reporting requirements, which remain challenges for civil society and community implementers. 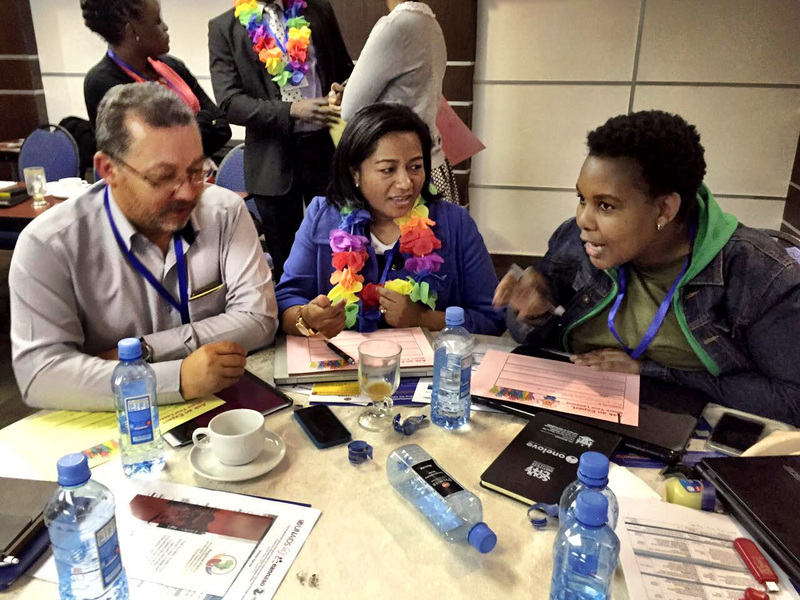 In April 2016, the Global Fund hosted a High Impact Africa II regional meeting forum for sharing country implementation experiences in Maputo, Mozambique. There is a dearth of information for civil society implementers, particularly new PRs. Vincent Titus from Kheth’Impilo, a new PR in South Africa as of 2015, said, “It’s not just about having manuals available. The Global Fund has an obligation to help you interpret that information.” The civil society PR workshop was an attempt to address this gap. In a similar effort, a series of Global Fund Community Guides have been released by EANNASO, translating the complex policies of the Global Fund into more accessible language and formats. The workshop featured sessions on managing sub-recipients, integrating human rights and gender into grants, managing relationships with key stakeholders, and managing risk across a wide range of issues. Civil society PRs shared strong opinions about what needs to happen to make dual track financing work for communities. “It’s no longer about reaching out to patients, it’s about who holds the money! This is not right. We must consolidate the gains we have made as PRs,” said Michael Kachumi from the Churches Health Association of Zambia. CHAZ has been a Global Fund PR since 2003. A significant portion of the workshop was dedicated to exploring options for technical assistance (TA) for civil society PRs. Interestingly, the majority of civil society PRs that attended the workshop had not heard of the Global Fund’s short-term TA program – a $4 million pot of money within the Community, Rights, and Gender (CRG) Special Initiative. The limited knowledge of the CRG short-term TA Program could be because this TA does not extend to grant implementation, though civil society PRs are able to access this TA during country dialogue, concept note development and grant-making. There have been calls for the Global Fund to extend this support to include short-term TA for grant implementation. In order to create a more formalized space for civil society PRs to continue networking and engaging with one another, participants in the workshop committed to establishing a community of practice for civil society PRs in Anglophone African countries. The community of practice is slated to be housed within EANNASO, in its capacity as host of the Regional Platform for Communication and Coordination for Anglophone Africa (part of the Global Fund Community, Rights, and Gender Special Initiative). The community of practice will meet bi-monthly for virtual conference calls and webinars to identity and define the key issues and problems that members need to address. The members will also seek to develop a set of communal resources, including Q&As, experiences, stories, tools, and ways of addressing recurring problems. An annual in-person forum will complement the virtual platforms. The community of practice will work closely with the existing Civil Society PR Network (CSPRN), functioning as a regional sub-forum. The co-chairs of the CSRPN (from Save the Children International and World Vision International) were both present at the meeting in Nairobi to ensure that the regional community of practice and the CSPRN can be mutually supportive. Do you want to join the Civil Society Principal Recipient Network (CSPRN), a global network of civil society PRs? Contact the network’s co-chairs: Barbara Reickhoff (brieckhoff@savechildren.org) and/or Ann Claxton (ann_claxton@wvi.org). Do you want to join the Anglophone Africa community of practice for civil society PRs? Contact Olive Mumba at mumba@eannaso.org. & Development Communication (right), learn from Pact (centre), an experienced civil society PR in Madagascar. find joint solutions, and establish a community of practice.